January, 2006 - AKVIS LLC announces the release of AKVIS Enhancer V.3.0 for Windows and Macintosh. The new algorithm introduced in v. 3.0 makes this detail-revealing software yet more efficient. Now the plug-in supports 16-bits per channel. It may happen that a photographer will take a great photo but some details within it will be lost due to unevenness of exposure; faces may be cast in shadow, or scenery wiped out by overexposure. Merely manipulating the brightness and contrast of the whole frame with photo editing software can improve the problem in some portions of a photo, but might then spoil other areas that need different treatment. Here lies the strength of AKVIS Enhancer. AKVIS Enhancer strengthens the difference between adjacent pixels having different color gradations and reveals details within shadowed, overexposed or mid-tone areas. Where other similar programs may achieve acceptable results by manipulating two to four shots of the same scene, AKVIS Enhancer applies advanced algorithms to a single shot for spectacular outcome. Most images can be improved at default settings. For further adjustment you have four parameters at your disposal: Details in Shadows, Details in Highlights, Level of Detail and Lightness. The new improved algorithm prevents noise that may appear on a photo after a dramatic increase in detail. Now the resulting image is sharper and more natural. The new version of AKVIS Enhancer supports 16 bits per channel. It gives you the opportunity to process images without losses in quality. In addition to its appeal to the amateur photographer and home user, AKVIS Enhancer is a highly useful tool in the production of technical and industrial photographs, or for revealing subtle details within medical imaging and forensic photos. 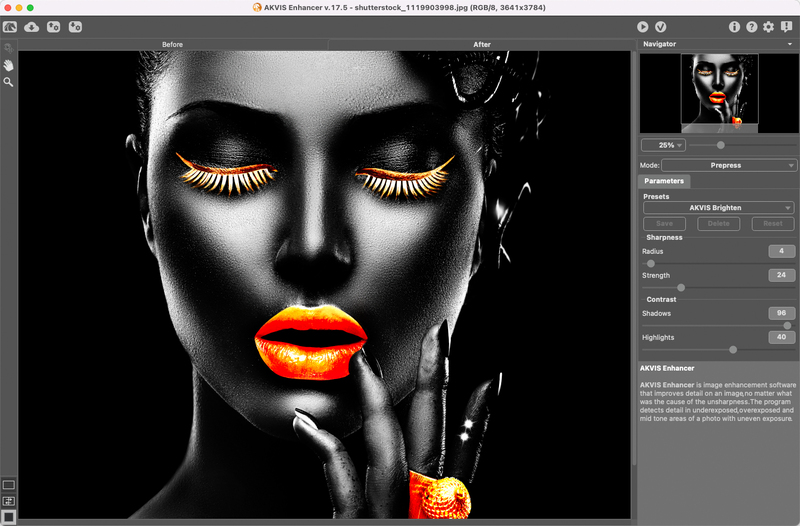 Demonstrations of AKVIS Enhancer's features are available in Tutorial. AKVIS Enhancer plugin is compatible with Adobe Photoshop and Photoshop Elements, Corel Painter, Corel Photo-Paint, Corel (Jasc) Paint Shop Pro, ACD FotoCanvas, and Ulead PhotoImpact. The full list of the image editors compatible with Enhancer is available on the compatibility page. AKVIS Enhancer runs on Microsoft Windows 98/ME/2000/XP/NT and on Macintosh Mac OS X 10.4 (Tiger), PowerPC G3 and above. AKVIS Enhancer sells for $69.00 US, downloadable from akvis.com . For a free trial, AKVIS offers 10 days of fully functional use. One license key allows activating the software on two computers, for example, on a desktop and a laptop. Details are available in the Download section.